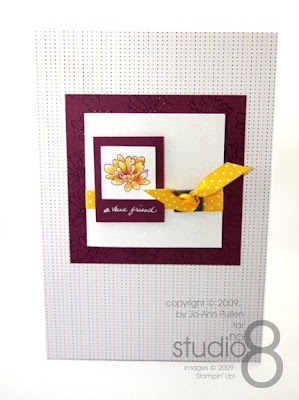 The latest issue of Stampin' Success was released on-line yesterday see here and I was delighted to share this with you. So I am delayed by one day with my posts for the 7 Day Challenge but I am sure you will forgive me for this. For today’s two pages it’s all about journaling, on the left you have a little card that closes with a ribbon, on the right you have some vellum which is great for journaling, using a gold/silver/white pen, which is so pretty. Take your Rich Razzleberry 4.5 w x 4.5 h using one of the flowers from Flower Lines Stamp Artwork apply VersaMark to the stamp and create a background with this stamp. 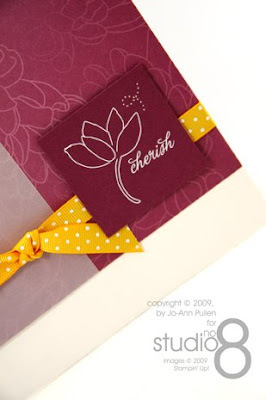 Apply Clear Stampin Emboss Powder to the VersaMark image and using a heat gun melt until the powder disappears. Repeat this step using the Whisper White 7 w x 3.5 h, score and fold, add ribbon so it will wrap around, you can either tie a not or in my case I used a buckle that I had hanging around. 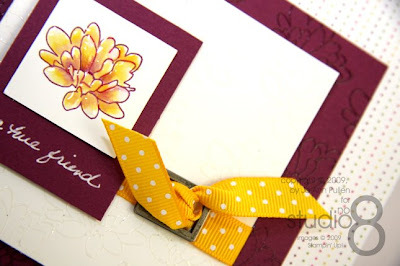 Using a scrap piece of Whisper White card stock and Rich Razzleberry classic ink stamp the same flower then fill in using Blender Pens and Crushed Curry classic ink create shadows using Rich Razzleberry classic in. Add Crystal Effects to give it some sparkle and dimension. Assemble as per sample, and using uni-ball Signo Gel Pen write a message below the flower. Take the Vellum card stock 6 w x 9 h and choosing one of the various images from the rub-ons and add to the vellum, that easy and very pretty. Take Vellum card stock 2.5 w x 8.5 h and DSP Lovely Flowers 6 w x 7.5 h (purple flowers) and apply adhesive and attached vellum to DSP paper. Take ½ inch Polka-Dot Grosgrain Ribbon Crushed Curry add adhesive and also attach to DSP paper, using another piece of ½ inch Polka-Dot Grosgrain Ribbon Crushed Curry and tie not. 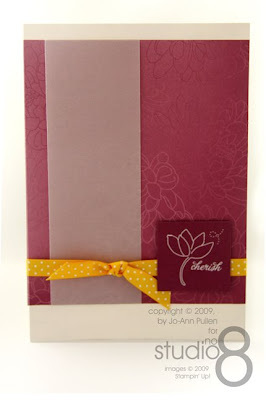 Take Rich Razzleberry 2 w x 2 h and Lovely Lines Rub-ons and choose a flower and words apply to cardstock. Take two Stampin Dimensionals and apply to back of Rich Razzleberry 2 w x 2 h and assemble as per image. I love the colours on this one!!! Yellow just makes it P-O-P!